These mats were a part of my giveaway last week and I had a few people ask if they were available for downloading! My three year old is just mastering the 1:1 correspondence skill and these mats were really fun for her. These pages work on numbers one though five! 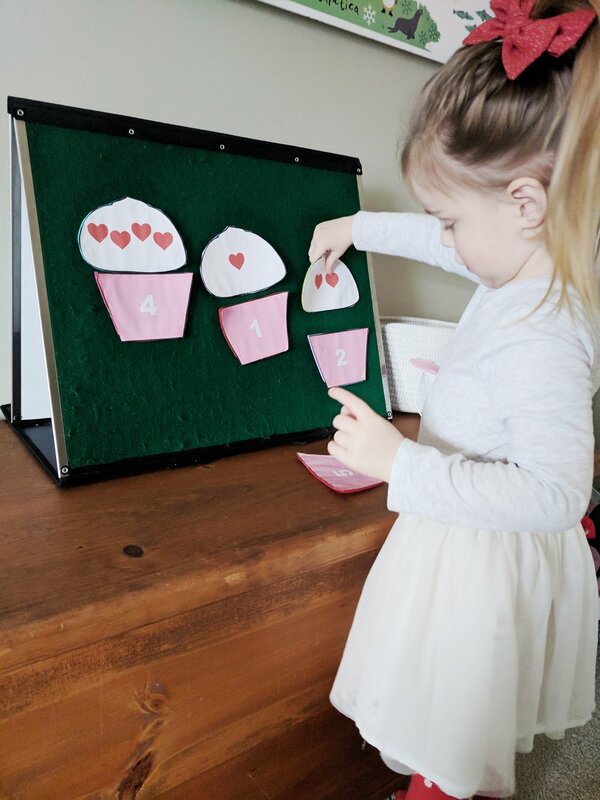 I laminated each page using this laminator and these pouches, and she used playdough to count the candy hearts on each page. I actually made this printable last year as a felt activity but spruced it up this year for an easier to assemble printable! I chose to laminate my set so that it would last a bit longer but that is definitely not necessary! I started this activity with my three year old by laying out all of the cupcake tops. I placed a number bottom in front of her one at a time and asked what number is was. Then she looked for that amount of hearts from the tops laid out for her. If she was confused, I encouraged her to count the hearts to check! I backed one set of cupcakes with felt to use with our felt board! The other set I just laminated and we laid them out on a table to use! I hope you can enjoy either of these printables with your kids or students! We hope you have a great Valentine's Day!